It was my lucky day to find this 1850s trade card at the 33rd Ephemera Society's Conference. 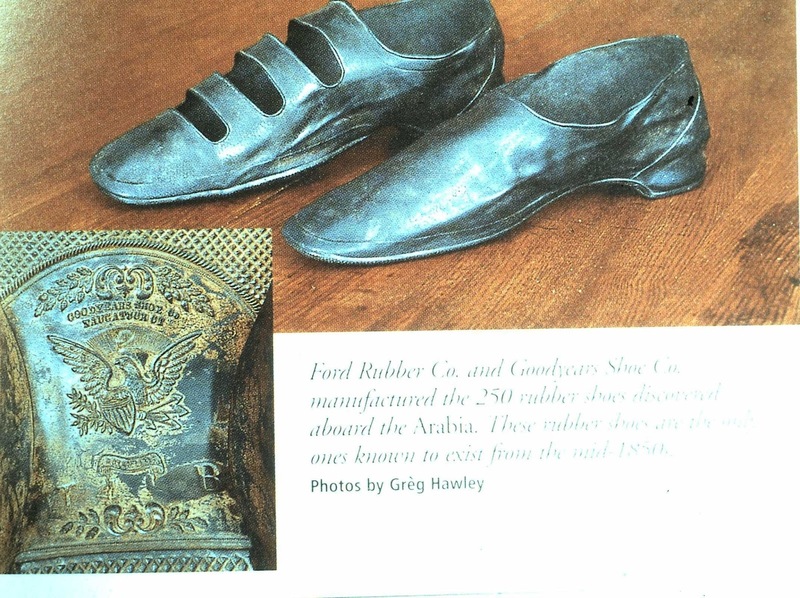 And yes, this is the company that manufactured the same rubber shoes in the Arabia Steamboat Museum. One Trade Card can tell a big story. 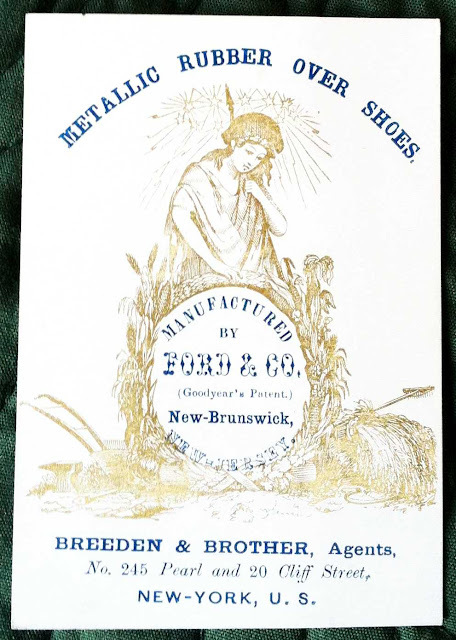 The Manufacturer was Ford & Co. in New Brunswick who made the shoes with Goodyear's patent- The Agent was Breeden & Brother in New York City who wholesaled the shoes- and which St Louis store sold them to the Arabia's consignee is still an unsolved mystery. Photo courtesy: Greg Hawley's book, Treasure in a Cornfield. For those fascinated by Arabia Steamboat Museum's rubber over shoe display, you may want to make another trip after reading my blog. 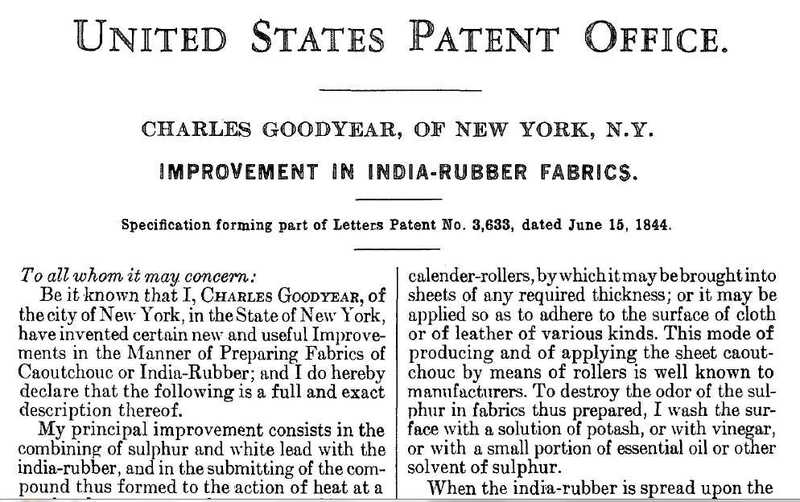 There were many companies making Rubber Over Shoes, and not all used Goodyear's formula. 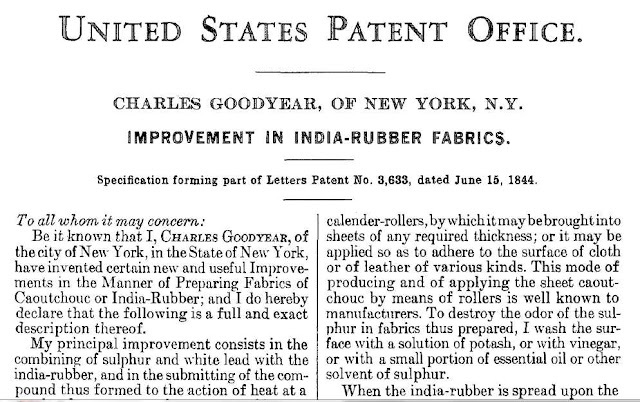 Charles Goodyear's Patent 3633 for Improvement in India Rubber- Interesting reading so hit the link. Before buying the card, I googled on my I-Phone Breeden & Brother ensuring they were at the same address and yes, they were manufacturing their shoes in Scotland. That's pretty exciting! 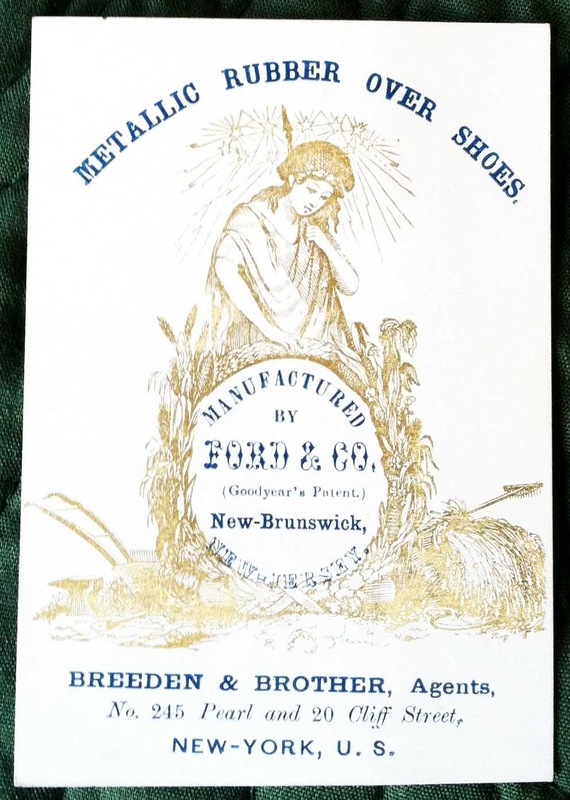 Notice- Buyers of FORD & CO's celebrated Metallic Rubber OVER SHOES, are informed that the recent fire at their warehouse did not destroy the buildings containing the machinery; the detention therefore will be but three or four weeks, when all will be rebuilt and in full operation. We soliett an examination from the trade of the stock now in the store, amounting to over 200,000 pairs comprising all the various styles. Dealers may rely on having their orders promptly filled as usual. 245 Pearl St. & 29 Cliff St.
Christoper Meyer, Henry Lee Norris and John Ross Ford, all American citizens, formed the North British Rubber of Scotland. The machinery for the rubber over shoes was shipped to Glasgow in October 1855 and manufacturing began in Edinburgh by 1856.